خطیب جمعه سیاهکل افزود : مرحوم سید احمد خمینی گفته است که «اگر مقام معظم رهبری بفرمایند که سر بچه ات را ببر من این کار را انجام می دهم» و معنی این جمله این است که ایشان نماینده برحق امام زمان (عج) در زمان غیبت هستند و سخن ایشان سخن خداوند است. شیدایی با تأکید بر این مطلب که حضرت آیت الله خامنه ای بزرگترین افتخار برای جهان اسلام و شیعه هستند اظهار داشت : علمای عربستان ، قطر ، الازهر از افرادی که در کودتای مصر حضور داشتند حمایت می کنند اما علمایی همچون امام خمینی (ره) ، امام خامنه ای (مدظله العالی) و سید حسن نصرالله همواره به دنبال حق هستند. 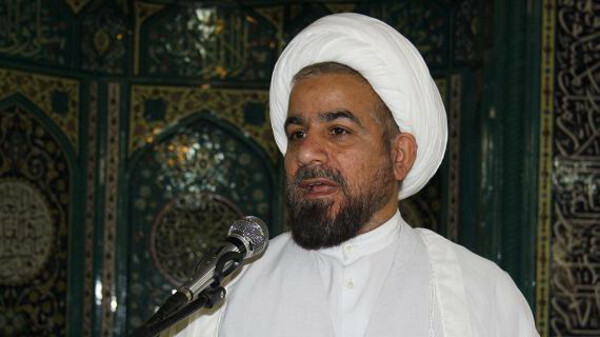 ‘Ayatollah’ Sheidayi said during his Friday sermon: ‘The late Sayyed Ahmad Khomeini (‘Ayatollah’ Ruhollah Khomeini’s son) said: ‘I would cut off the head of my own child If the Supreme Leader (‘Ayatollah’ Khamenei) would order me to do so’. [‘Ayatollah’ Sheidayi commented on this and said]: ‘The meaning of this is that he [Khamenei] is the true vicegerent of ‘Imam Zaman’ during his occultation and his [Khamenei’s] words are the words of God‘. He added that Khamenei is the biggest proud for the Islamic Ummah and the Shia and that Muslim scholars in Arabia and even Azhar betrayed the Egyptians whilst Khamenei and Nasralla(t) stood for the truth! Khamenei and Nasrallat stand for the truth, the two tyrants who chant empty slogans (‘death to America/Israel’) yet have killed so far (together with their Bathist-Alawite and Russian and Chinese Kafir allies) more Sunnis in Syria than every Zionist could have imagined. Vilayat-e Faqih managed to illustrate Tawhid! 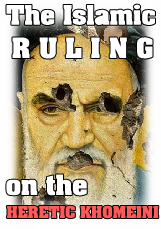 ← Sunnis of Tehran haven been prevented (again) of holding their ‘Eid prayers!